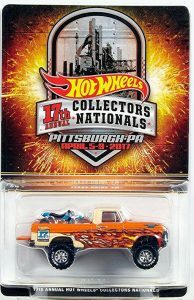 The second souvenir car for the 17th Annual Hot Wheels Collectors Nationals is a fantastic looking Texas Drive ‘Em. It’s sure to be a hit with attendees and collectors alike. The event will be held April 5-9, 2017 at the Doubletree in Pittsburgh, Pennsylvania. For more information and first look at the Texas Drive ‘Em check in at the Collectors Events Unlimited Facebook Page.